Chiropractic treatment is an effective treatment of referred pain for most people. Referred pain is not a new invention of modern therapists. Doctors Janet Travell and David Simons did a fantastic job in explaining it and increase the awareness by writing the book Myofascial Pain and Dysfunction: The Trigger Point Manual in 1983. The theory and science of referred pain is part of chiropractic education. Therefore, Chiropractors are well aware of the fact that referred pain is something that needs to be considered in patients complaining of any type if pain. It affects everybody to some extent, some more than others. As part of chiropractic training we have to learn the patterns of referred pain of all the muscles and internal organs, this is to ensure that we make an accurate diagnosis. Anybody who doesn't consider referred pain in a pain condition is likely to make the wrong diagnosis, or at best fail to consider an important source of pain. Which structures cause referred pain? Referred pain can be caused by the internal organs as well as muscles, nerves, ligaments and the bones. This is referred to as visceral (internal organs), sclerogenic (bones), neurogenic (nerve) and myofascial (muscles and ligaments) referred pain. The most well known form of referred pain by internal organs is probably the feeling of pain in the left arm or shoulder, when the real cause is the heart, during a heart attack. This is, of course extremely important for any therapist or physician to be aware of, including chiropractors . Referred pain from the ribs and certain muscles can often give pain in the same distribution and it is obvious how important it is to be aware of both causes of pain. There are other very typical patterns of referred pain that the chiropractor has to include in the list of diagnosis, such as pain in the right shoulder from the liver and gall bladder, and pain in the left shoulder and mid-back from a painful pancreas. However, the more common structures that refer pain in chiropractic patients are the muscles, ligaments and joints. The areas that can be affected by referred pain literally cover the whole body. Yes, the whole body. Just to illustrate the point we will first look at a symptom such as pain over the face and head. 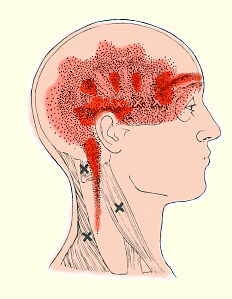 In the majority of cases, headache is not caused by pain from structures in the head. For example the brain is not pain sensitive. The covering of the brain is and the blood vessels are but not the brain itself. So the most common source of pain felt in the head is referred pain from the muscles and joints in the neck, the jaw and some jaw and facial muscles, and also the teeth and gums. Here is an example of muscles that refer pain to the head. You can probably recognize some areas of pain that mirrors headaches you have had in the past. Many of the nerve endings converge and share the same nerve cell-pool in the spinal cord and as the signal travels up the spinal cord to the brain the signal 'lands' on the same area as pain signals from another part of the body. The awareness of pain is felt in the thalamus (a deeper centre of the brain) but the awareness of where the pain is coming from, the location of pain, is determined by the sensory cortex on the surface of the brain. The quality of the pain with referred pain varies for different structures and also varies depending on the level of inflammation. Many textbooks on the matter like to present things as black or white. For example, nerve pain tends to be sharp in nature but muscle pain tends to be a deep ache sometimes burning. But in clinical practice you realize that the pain can be quite variable from one person to the next. Some muscles can give a sensation of tingling in the area of referred pain, but tingling is traditionally considered to be associated with nerve injuries. It is important to know this when you attempt to diagnose a problem, because without an accurate diagnosis the treatment is bound to fail. Why do we have referred pain? Very little research has been done in this area due to its complexity to investigate. Many suggestions have been made by various people, but the fact remains that pain is there to stop us doing further harm, it is there to tell us to slow down and reduce a particular activity. Not for us to take painkillers and carry on as if nothing was wrong. The fact that we sometimes feel the pain in a different area from where it comes from can best be explained by studying embryology. The human embryo develops in different stages and some parts of our anatomy are closer together in the beginning. As it matures, these parts migrate away from each other but remain closely linked when it comes to referred pain.